Originally posted on the Scholars’ Lab blog on January 15, 2019. We’re happy to announce that our Lab website has a new look and feel, all aimed at making Scholars’ Lab more accessible and the site more useful. The website ScholarsLab.org represents the collective effort of our staff and collaborators, past and present. It’s existed in multiple forms: most recently, as a WordPress site and now, as of this blog post, as a Jekyll-generated static website. We’re a community lab focused on experimental scholarship. We care most about the impact of scholarship on people, ranking positive human experience as the most important outcome of projects or other work. This means that failure and a journey of many iterations are not just frequent by-products of our work, but essential characteristics. For example, we periodically renew our lab charter to reflect our ongoing growth as scholars and professionals; as it was last updated in 2016, we’ll be renewing its text (and even, perhaps, its form) over the coming year. Why does the site look this way? We started thinking about a site renewal back in Summer 2017, with two rough goals: a general rethinking of the site to fit our current work, and a migration of platforms from WordPress to a Jekyll-generated static website. (You can see this article for more on what a jekyll-generated static site is, why you might want to use one, and how.) WordPress is a popular blogging platform with the advantage of a user-friendly administrative dashboard. are in line with our teaching each of our Praxis cohorts the basic steps required to use git, GitHub, and markdown (i.e. by teaching these skills to our team and affiliates more broadly, we hope to also enfranchise folks to create their own websites with the same technologies). After much discussion and work, these initial goals yielded a more important goal: reimagining our website to more clearly focus on making the lab accessible to folks who wouldn’t otherwise already know about or feel welcome to join us. We already have some friendly and well-trodden paths to reaching the lab, such as through our work and fellowship CFPs, consultations, events, and open office hours; so we decided to aim the website at reaching folks who weren’t already coming into our space. Encouraging site visitors to feel they’re in the right place, by updating textual content and photos to be more explicitly welcoming. For example, we reorganized our Makerspace and Spatial Tech equipment and software inventories into named categories; you might not know what a serger is, but where you’d probably just skim past the word before, you can now see that it’s part of a set of equipment and supplies aimed at making things with fabric. The hope is that by grouping resources like the serger into clearer categories, you might realize that our Makerspace has some resources and folks you can talk to about, for example, your interests in making stuff from textiles, historical costuming, and/or other fabric art approaches. Making the info folks need to get more involved easy to find, once they feel comfortable with our resources being theirs. We wrote a FAQ anticipating questions folks often ask us, overhauled the structure of information on our site (e.g. menu order and wording, page titles, layout and order of information on a given page). We also created clear maps showing how to get to the specific locations within our somewhat large space (the west wing of the 4th floor of Alderman Library). Accurately capturing the work of all our current staff, including recent hires and folks welcomed into the lab during the library reorganization (who hadn’t had their work represented on the old site), to show the true breadth of disciplines and approaches we cover. We also reworked the metadata on each of our current and past Scholars’ Lab folks, so that we could more easily and accurately show what roles folks have held and who has contributed anything to a given project—again, more accurately showing how the Scholars’ Lab is itself a digital scholarship project, one built together by many people over the years. More clearly showing that we’re part of the UVA Library, so folks understand that we’re part of the Library’s mission to provide equitable access to knowledge and learning to everyone. 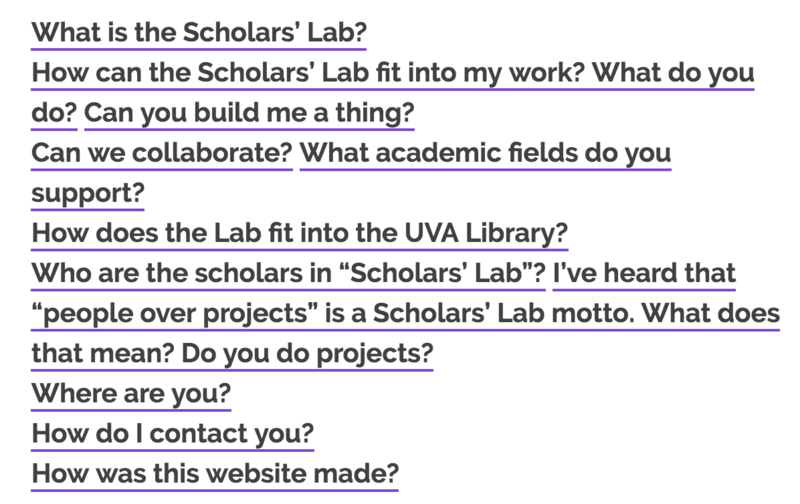 This work includes an FAQ question, a section of the homepage with text and the UVA Library logo, and a new SLab “Library” page highlighting the work of Library colleagues that helps us do what we do, and that may feature stories about intralibrary collaborations in the future. The 2017-2018 renewal of this website incorporates text, suggestions, and feedback from everyone on the Scholars’ Lab staff. Additionally, the following folks put in significant extra effort on the site’s design, coding, content, project management, and documentation: Katherine Donnally, Jeremy Boggs, Brandon Walsh, Ronda Grizzle, Laura Miller, Zoe LeBlanc, Ammon Shepherd, Shane Lin, Beth Mitchell, and Amanda Visconti. We want to especially highlight the leadership and labor of Katherine Donnally (Scholars’ Lab DH Designer 2017-2018) in realizing this site. Katherine’s thinking and work gave the renewal project a coherent focus around making the lab more accessible and supportive of folks who might not otherwise feel part of our community; in addition to design and development work, she created structures and documentation (e.g. goal and progress tracker, code commenting, analysis of the old website, articulation of the purpose of the new site) that were instrumental in both imagining the new site and seeing it to the finish line.